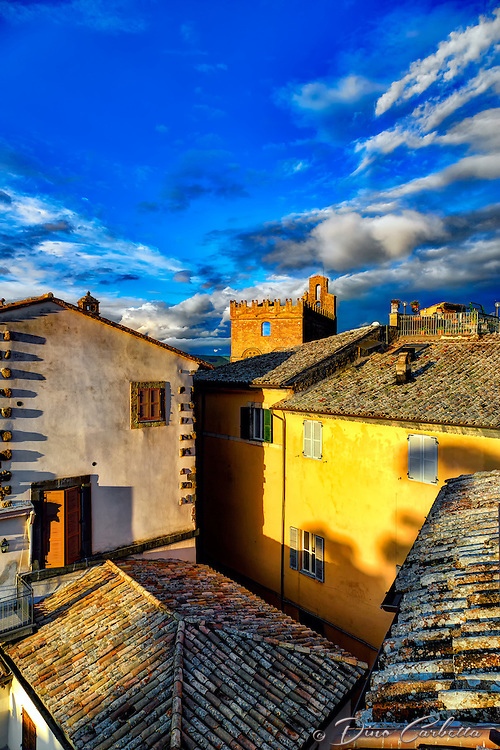 At the peak of its economic power and political stability, towards the end of the 13th century, the Comune of Orvieto decided to move its civic buildings to the restored Palazzo Communal, and to build the Palazzo del Popolo, La Torre del Moro, and the Duomo di Orvieto. The tower has maintained many functions including water storage for “the city on the cliff.” The Duomo is an Italian, ornate architectural masterpiece. The facade is one of the most famous in the world and looks like something seen at Disney World. Constructed under the orders of Pope Urban IV to commemorate and provide a suitable home for the Corporal of Bolsena, a miracle which is said to have occurred in 1263 in the nearby town of Bolsena. A traveling priest who had doubts about the truth of transubstantiation found that his Host was bleeding so much that it stained the altar cloth. The cloth is now stored in the Chapel of the Corporal inside the cathedral. This evening image was photographed from my rooftop terrace at the Grand Hotel Italia.